Click picture to see larger picture and other variations. Needle nose or rosary pliers. 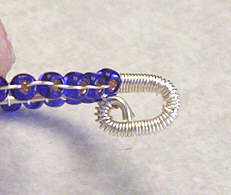 Begin by cutting a piece of 18g wire and wrapping it around a mandrel in the size you want. (Be sure to leave enough extra wire for forming the bail.) 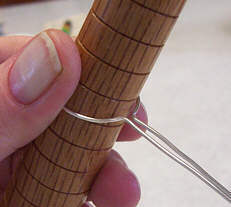 After wrapping it around, take your bent nose pliers and squeeze the wires together close to the mandrel where they meet, so that the two ends are lying next to each other like in the picture. 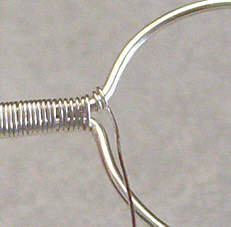 Starting with about 30-36" of 28g wire, you can begin wrapping the wire around the ends. I like to put a piece of tape at the very end to hold the wires flat when I start. You can wrap as much as you want, depending on the size of bail you'd like. On this one, I wrapped about an inch. It's better to wrap too much than too little...you can cut any excess off later. 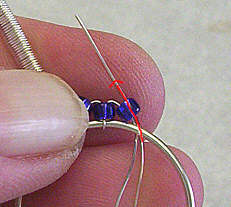 When you've wrapped all the way down to the hoop, make a couple of wraps around one side of the hoop as shown, with the wire coming up through the middle of the hoop. Now you can start adding the beads. (Sorry for the blurry picture!) 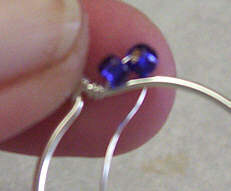 Begin by picking up 2 beads, and sliding them down to the hoop, with the wire on the outside of the hoop. 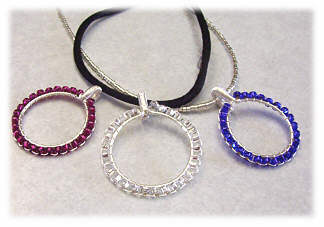 Bring the wire through the middle of the hoop, then up through the bottom of the seond bead, so that the wire is wrapped around the hoop. Pull tight so that the beads are lying next to each other. Now add the beads one at a time. 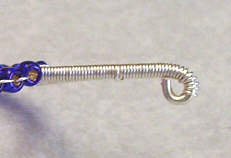 Pick up a bead, and slide it down to the hoop. 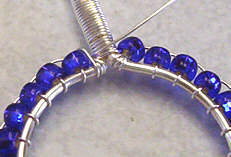 Bring the wire from the outside of the hoop through the middle, then up through the bottom of the bead and snug it up. Continue on until the entire hoop is beaded. Now we can make the bail. There are several ways to do this, so if you don't like this way, just use your imagination and see what you come up with! On this one, I cut the wire about 1/8" from the end of the wrap. Then I take my rosary pliers and turn the unwrapped ends under. Then I turn the rest of it under using a wider part of the pliers. If you don't care for the double loops, you can just turn a single loops like this. Click here to help support this site!